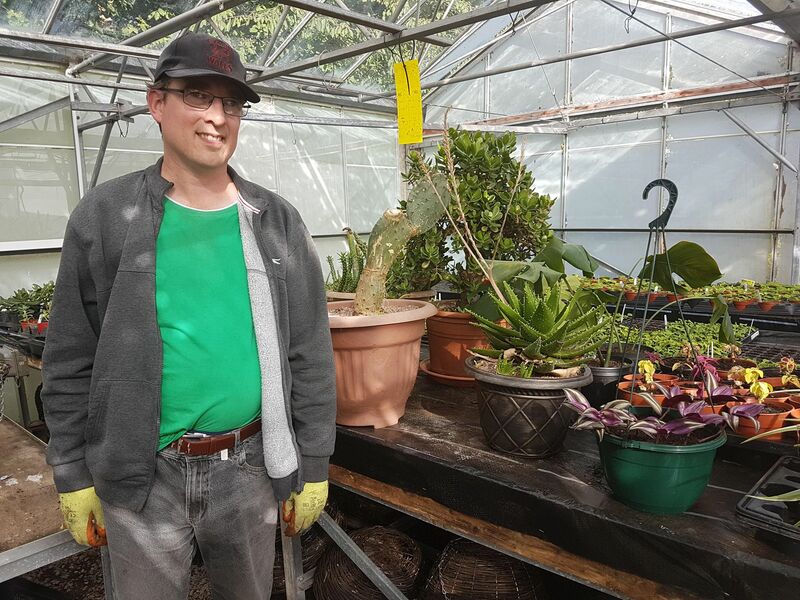 For over thirty years, Bryn Euryn Nursery has provided people with learning disabilities with daily activities at a busy horticultural nursery. The nursery in Colwyn Bay offers those attending the chance to gain horticultural skills, along with an opportunity to socialise. The Conwy County Borough Council-run service helps sustain itself by cultivating garden plants and producing hanging baskets and planters, which are then sold to town councils and the public. In addition, plants, flowers, bulbs, perennials, wreaths, bedding, and seeds are sold in the shop onsite at Dinerth Road. Bryn Euryn also plays its part in reducing plastic waste by having an area set aside for anyone to deposit plant pots they no longer need. The team then sort through these and reuse as many as possible in the nursery with the remainder going to a local recycling centre. The nursery also says composting is an important on-going process. Peter Rule is a day service support worker at Bryn Euryn and explained the benefits for the people who attend. “For individuals that attend the nurseries, there are clear social benefits. As well as providing structure and a routine, work provides improved self-esteem and a feeling of being valued. “This becomes particularly clear when deliveries of hanging baskets, planters, or displays for local events are made and the contribution of everyone involved in the process is acknowledged. “Settings such as the nursery provide opportunities for meaningful activities. One particular individual who historically attended a traditional day centre, and had done so for many years, was given the option and opportunity to attend the nursery for one day each week.